Here’s an interesting one from slots developer Microgaming: an online slot that can you see you lose money as well as win it. Confused? That’s the downside to a Chinese-themed slot that promises much but certainly puts the gambling element into online slots. A 5 reel, 20 pay-line slot, and with betting starting at just $0.01 a coin, all seems normal enough to start with, and fans of lush Oriental backdrops should have nothing to fret about. On the reels are plenty of symbols from what you’d expect from a Chinese-themed game: dragons, fans and lanterns, an Emperor, and Oriental-styled 10-through-Ace symbols. There are two Wilds in the game, firstly the golden Dragon icon - where five of those across the reels award a tasty jackpot worth up to $50,000 if hit at the top betting range – and the silver-bearded emperor. Wilds substitute for all regular symbols other than the Scatters. The fan Scatter works in an interesting way, namely that if you hit three or more across the reels, the fans will open to reveal bonus multipliers. Those multipliers accumulate to show you your total win. Anything up to a jackpot of 800x your total bet can be bagged, so it’s a great bonus to trigger. It’s the bow and arrow Scatter that triggers the Bonus feature, but you must get three or more from left to right. Doesn’t sound so easy now, does it? If you do hit three or more, you’ll be taken to the archery range where you have to hit various targets. By hitting different areas of the target you can win a multiplier on your Scatter win up to 4x (if you hit the central area). 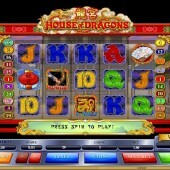 However, you can also gamble your winnings to take a chance of spinning up your cash, or simply take the money and run. Gamble and lose and you’ll be penalized some of your winnings. 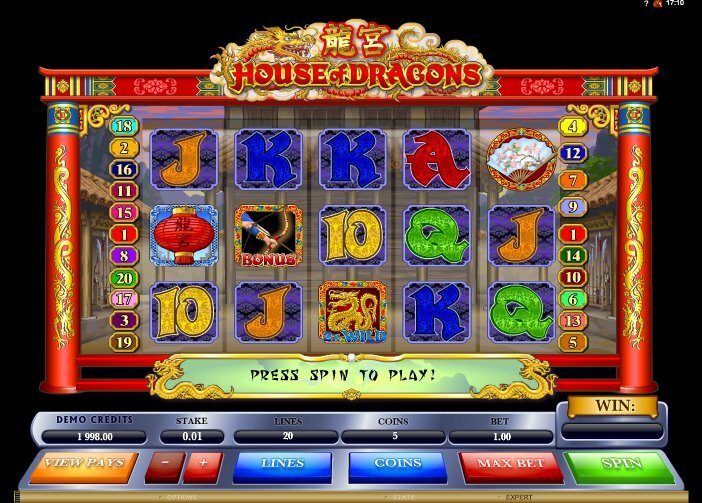 With two Wilds that seem to crop up a lot, and bonus rounds that cater squarely for the gambler, House of Dragons will definitely appeal to many fans, but I’d have liked to have seen a free spins round thrown in for good measure. Sometimes, it seems, you can’t everything you wish for. For fans of Oriental-themed slots, there’s plenty of choice out there in slotsland. Asian Beauty, Microgaming’s other Asian-themed slot, is cut from the same cloth as House of Dragons obviously, with its beautiful imagery and exotic music. In fact, while we’re at it, how about another Microgaming slot based squarely in the Orient – Jewels of the Orient.